If your idea of camping is spending the night at the nearest hotel, then this newest trend in outdoor living must be just for you. 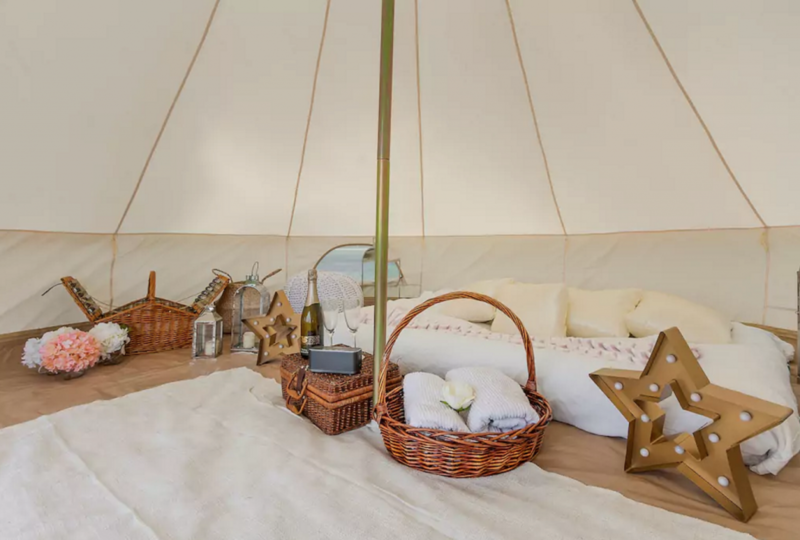 Known as ‘glamping’, this term is an amalgam of “glamour” and “camping”; and it’s the new way of combining the fun of camping with the comfort and luxury of a five-star hotel. 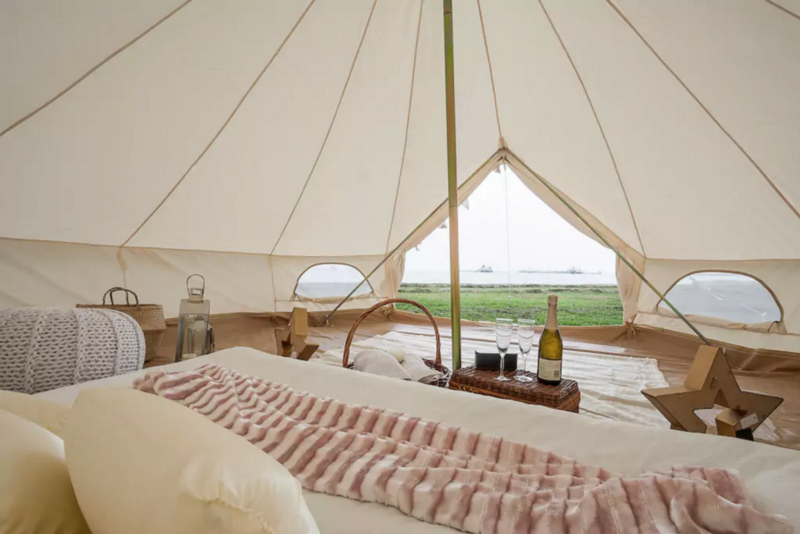 Glamping sites are abundant in Asia, but it is unfortunately not rampant in Singapore – which is why the Chia sisters are fuelling the trend here. Leveraging on this untapped opportunity, the duo decided to establish Glamping Society, as their sideline jobs, last year. “When we saw amazing photos of glamping all around the world on social media, we realised that this wasn’t available in Singapore. 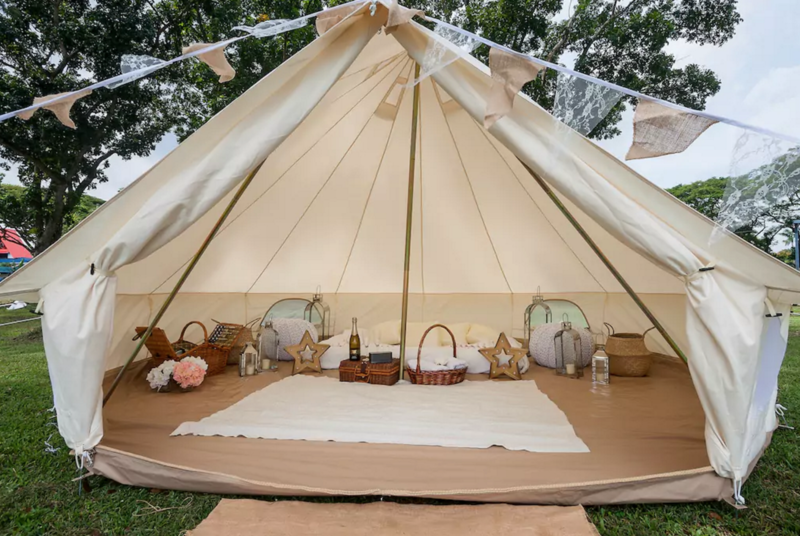 We love the beautiful shape of the bell tent, and the comfortable outdoors lifestyle called out to us,” said co-founder Lydia Chia, 34. “It’s much more than providing a beautiful bell tent for our customers. We give them the opportunity to experience nature in a way they might never have thought of doing otherwise,” she added. 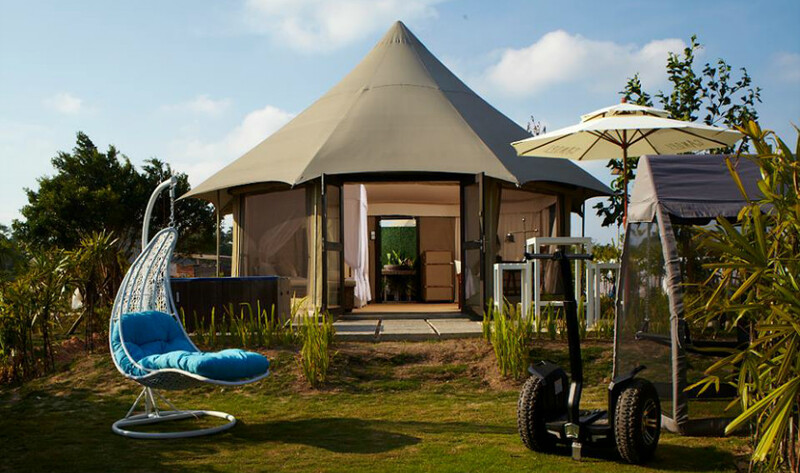 So what are the perks of glamping, that would convince Singaporeans to ditch the rustic charm of camping? “Camping involves the dirty work of logistics, setup, digging around in the dirt, and uncomfortable sleeping bags. This deters many people from wanting to camp as it doesn’t feel like a holiday,” explained Lydia. In other words, glamping is the perfect option for those who love nature, but hate roughing it out in the wild. 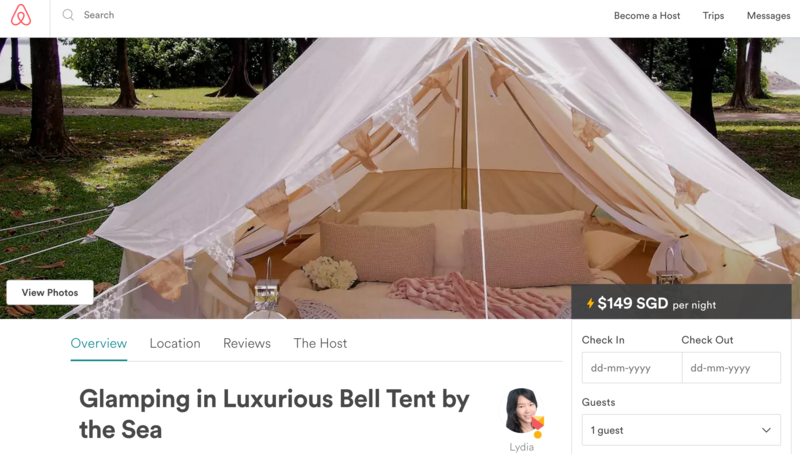 Lydia started advertising her glamping services online – via room-renting site Airbnb, and Instagram – late last year to help get word out. 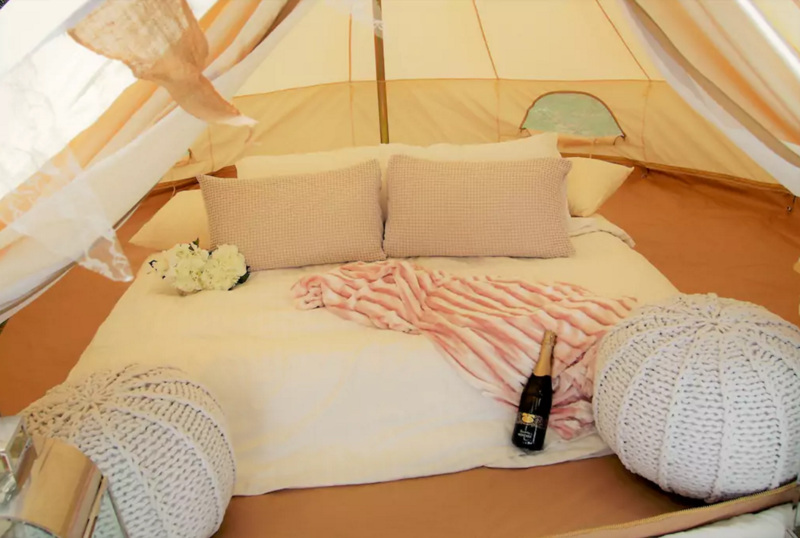 Her glamping packages are priced from $150 onwards, and include “luxurious amenities”, such as a double bed with premium linen, downfeather and support pillows, fresh towels, ottoman poufs, soft rugs, and floor cushions. The tents will also include a complimentary ‘mini-bar’ ice box stocked with cold drinks and snacks, a wireless speaker and USB portable chargers for smartphones. Optional extras include a free-standing hammock, an inflatable pool, and breakfast baskets. This sounds exactly like a camping experience that will not sacrifice the comforts a 21st-century Singaporean cannot live without! Just a disclaimer: According to National Park camping regulations, permits are required for all campers. Hence, this service is only open to Singaporeans, Permanent Residents, and Singapore Work Pass Permit Holders. On weekends, Lydia and her sister – occasionally with the help of a bunch of good friends – would go around Singapore, mostly East Coast Park area, to pitch tents. Their job isn’t exactly a walk in the park (pun intended). They often have to “fend off mud, twigs, giant ants, sand and other dirt during setup and teardown,” she lamented. The erratic Singapore weather is not helping either – it’s usually hot and humid; and when it rains, the ground gets muddy, which will make the setup process more difficult and messy. Nonetheless, Glamping Society has been enjoying good business so far. In a month, Lydia receives an average of 20 bookings. Her pool of clientele usually includes three groups of people – couples, families, and friends. She added that the feedback has been enthusiastic and positive so far. Many of her customers are new to camping and are stepping out of their comfort zone to sleep without aircon – but they end up loving the experience. Just look at her five-star rating and stellar reviews on Airbnb! 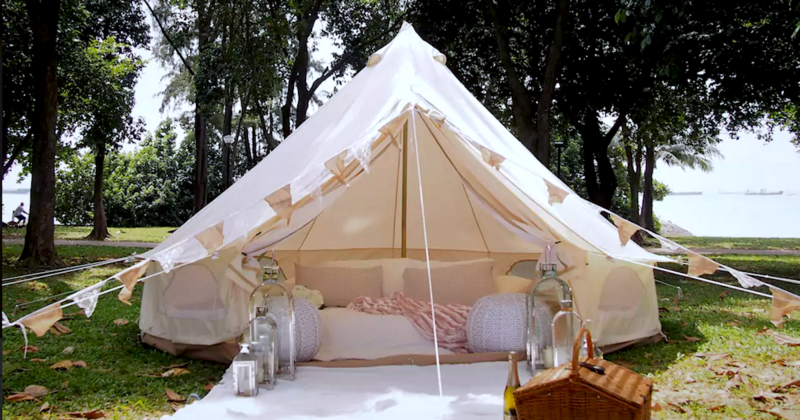 According to The Straits Times, glamping first arrived on our shores in 2012, but it failed to catch on back then. Fast forward five years later, there is a burgeoning trend of such bespoke services. Picneeds for instance, is another startup that is offering a bespoke picnic-planning service in Singapore. These services definitely speak to Instagram-obsessed millennials, who often seek unique experiences instead of the usual hotel staycations. It’s also very interesting to see how the two have taken such a simple idea and successfully convert it into a business venture. On hindsight, they might even be creating a niche hospitality market with the concept of “pop-up hotels”. In the future, Lydia said that she hopes to have a permanent home in Singapore for a “Glamping Bohemian village” with treehouses and outdoor play areas for both adults and children.